﻿In The Hobbit Smaug is the fire-breathing dragon who fills the role of the main antagonist to the heroes of Thorin and Company. 150 years before the events of The Hobbit Smaug invaded and laid waste to the Dwarf Kingdom of Erebor (in the Lonely Mountain) and the town of Dale. 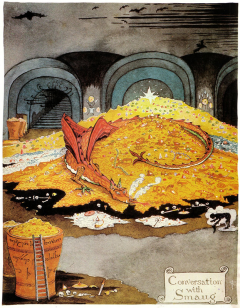 In line with his avaricious nature, Smaug takes all of the treasure within the mountain as well as the mountain itself. Spending a lot of his time sleeping on top of his treasure, gemstones and gold became embedded on Smaug's underbelly earning him the title Smaug the Golden. The Hobbit tells the tale of Thorin and Company, ( a group of 13 dwarves, Gandalf and Bilbo Baggins), who venture out to slay Smaug and retake the Dwarven kingdom of Erebor. Ultimately, Smaug is slain by Bard the Bowmen while attacking the town of Esgaroth.